When I first started giving a lot of speeches on sales, motivation, and referral marketing, I often found myself traveling home on airplanes late at night. I noticed that on these late flights, I seemed to have a lot of negative, doubting thoughts. I would even start to feel a little depressed. I was starting to hate the travel associated with what was/is exciting and rewarding work. So, I did a little research and found the quote from legendary football coach, Vince Lombardi, that is the title of this article. He was SO RIGHT! When we are tired, our courage and positive attitude seem to disappear, only to be replaced by negativity, fear, and inaction. Once I got in tune with this concept of how fatigue affects our thoughts and actions, I started handling it differently. Perhaps these routines I’ve developed will be of some help to you. Wimp Alert – When I’m tired, I’m on guard for negative thoughts and a sudden lack of courage to do what’s important – even if it’s not comfortable. My “wimp alert” is activated. That alone helps keep the negativity boogieman away. I’m not saying we always avoid negative thoughts or problems that occur in our life. Of course not! We face them with courage – as best we can. But being able to compartmentalize certain trains of thoughts or feelings has its place. Avoidance? No! Timing? Yes! Awareness is a powerful “muscle” for us to exercise. Self-awareness is the most powerful of them all. Tune your awareness into how your attitude and courage are affected by your energy level. Staying fit, of course, helps a lot. Being aware and adjusting when the negativity bogyman shows up will serve you – and everyone around you – quite well. 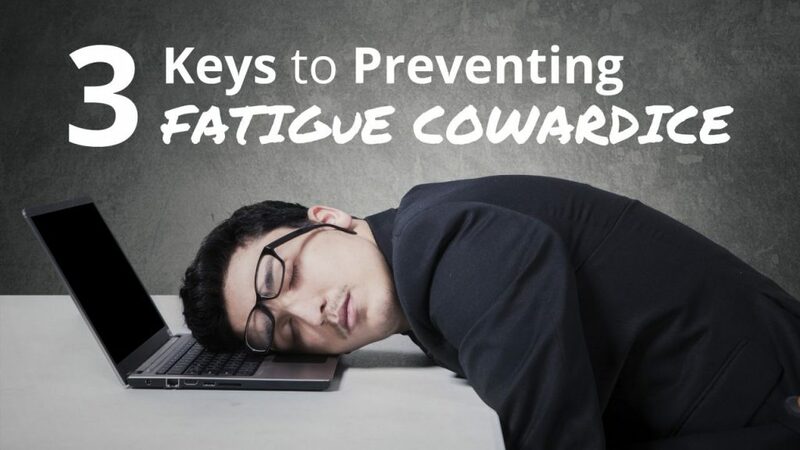 How Do You Deal with Fatigue in Your Life? Questions? Best practices? Type your questions and comments below. Let’s start a conversation and “share the wealth” of ideas. Ask for referrals/introductions without feeling uncomfortable? Get prospects to return your calls and emails? Confidently communicate your value in a way that turns ideal prospects into clients? Get introductions from key Centers of Influence? If you answered “YES!” to any of the questions above, you’re in luck. Over the past few months, I’ve offered a very limited number of exclusive, highly-discounted 1:1 personal coaching packages to my webinar participants. Due to the popularity, we’ve decided to extend this offer to our readers as well!